For five years I worked for my current boss, but on a different team. And every year around this time, she’d give that team some choice goodies from the Cuba Cheese Shoppe in Cuba, NY about a couple of hours away from us. I’ve moved on from that team to lead my own, and I wondered if I’d get the tasty cheese products this year. Turns out, I did! My boss really is an example (in many ways, but this one in particular) of the simple phrase “Do unto others….” On one hand, she’s Administration and the general workplace rule is to be as neutral as possible during the holiday season, because we serve a lot of folks at the dayjob who don’t celebrate Christmas, or anything at all. But if you do, she’ll throw out a Merry Christmas in a second, and if you’d accept it you’ll get a gift of fine local cheeses. For those of who aren’t into this particular holiday, I hope this time of year is exactly whatever you want it to be. For those who are, Merry Christmas! NOTHING IN THE DARK. Writer George Clayton Johnson (Logan’s Run, Star Trek, The Twilight Zone) passed away the other day. I had the honor of meeting him at my first Rod Serling Conference in 2009, where he gave one of his legendary stream-of-consciousness rants about everything under the sun, much of which was repeated in this interview, which I watched being given. WRITING. Got the acceptance email for PROJECT RUST last month! I’ll announce the details when the publisher does. Selling some writing always feels good; cracking a market you’ve targeted feels even better. And even as I cross this project off my list, another one comes on board, in addition to PROJECT FLOSS and PROJECT FIELD. Let’s call this… I dunno… PROJECT RICE. I’ll be out in the 216 until after the holidays. Catch you on the flip! Decided that this is going to be my last post of 2014. I think I’m past that year-in-review stuff. Instead, during this Christmas season with all of its stories of one kind or another, I thought I would share one of my own. SAM THE SNOWMAN stands naked, except for a loincloth and the holy symbols set into his snow body at each of his chakras, next to a “North Pole” sign. CUT TO: Each reindeer after its introduction. DASHER: I am Dasher. My planet is Mercury. DANCER: I am Dancer. My planet is Saturn. PRANCER: My name is Prancer. My planet is Jupiter. VIXEN: My name is Vixen. My planet is Uranus. CUPID: I am Cupid. My planet is Venus. DONNER: I am Donner. My planet is Neptune. BLITZEN: My name is Blitzen. My planet is Mars. RUDOLPH: I’m Rudolph! What planet am I? CUT TO: All of the other reindeer, laughing like a CACKLE OF HYENAS, until they suddenly stop. Male and female dwarves hustle and bustle around an industrial assembly line. Two of the little people, HERMEY and the FOREMAN, square off. HERMEY: But I don’t WANT to complete Santa’s collection of one-thousand testicles! The Foreman draws a toy pistol, as does Hermey. The dwarves stop what they’re doing and give the combatants a wide berth. They circle each other until Hermey fires first and hits the Foreman in the crotch. The Foreman goes down. Hermey goes mad, rolling around on the shop floor screaming, before scrambling out the door. CLOSE ON Foreman’s crotch. Yellow butterflies rise up from the bloody hole. The dwarves applaud. Hermey, now shaved bald and dressed in sackcloth, is riding on Rudolph’s back. Rudolph walks them past the skinned, crucified carcass of The Abominable Snowman of the North. At the foot of the cross sits YUKON CORNELIUS, a slender young woman dressed in furs and a belt of mining gear, smoking a cigarette. RUDOLPH: Is this the way to Lotus Island? YUKON CORNELIUS (in a man’s voice): If you think it is, then it is. Rudolph and Hermey are kneeling at the foot of the throne of the lion KING MOONRACER. He comes down and places his paws on their bowed heads as SITAR MUSIC plays. Standing in a hot spring pool, Rudolph and Hermey are being lathered in soap by two amputees, each missing legs, strapped to the backs of two other amputees who have their legs, but are missing arms. CLOSE ON Rudolph’s haunches being gently scrubbed. A winter storm rages across the North Pole, with a wind that sounds like CHIRPING BIRDS. Rudolph is joyfully reunited with Santa and the other reindeer. SANTA: Rudolph with your noise so bright, you must carry your light out into the world! (Turning to the other reindeer.) You no longer need a Santa. Santa pours lamp oil on his suit and lights himself on fire. 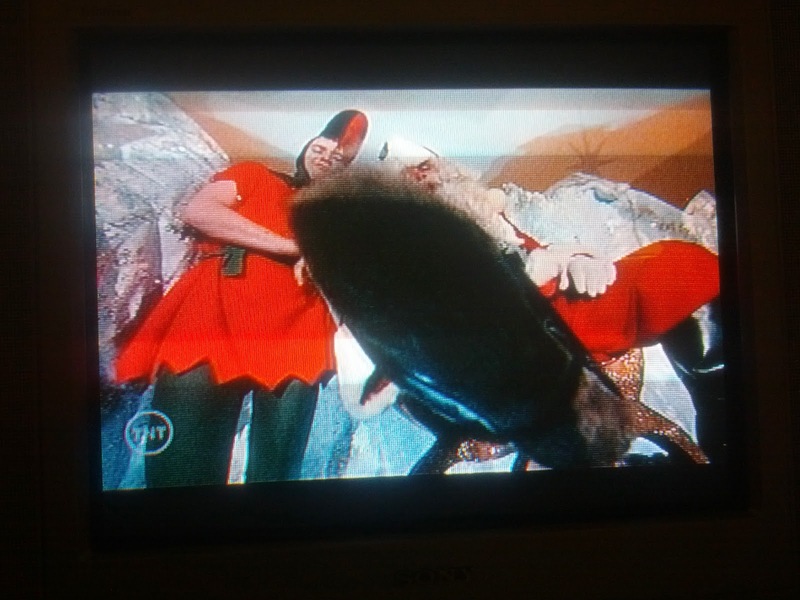 Rudolph bites into Santa’s charred corpse, tears away a piece, and raises his head in triumph! CUT TO: Rudolph’s face, which is covered in honey instead of Santa’s flesh. RUDOLPH: Real life awaits us!